Fresh red cherry tomatoes, green spinach, orange peppers, diced onions, and shaved carrots. Just close your eyes and picture how those colors pop. Is there anything more appealing to the eye than a tasty fresh salad? It can rival a lovely garden. And new research is showing those very ingredients might be responsible for your visual enjoyment of the healthy dish. Eat Your Carrots for Better Sight: Old Wives’ Tale or Truth? You’ve probably heard before that eating carrots can help your eyesight, and new research is reinforcing this often-contested notion. A recent review that lasted for over two decades is showing how people who eat more foods that contain carotenoids have a 40% lower risk of acquiring age-related macular degeneration (AMD) compared to those who don’t. Carotenoids are the pigments that give colorful fruit and vegetables their dynamic color. They are prominent in produce like carrots, sweet potatoes, and orange peppers, as well as deep-green veggies like spinach, broccoli, and kale. There are a number of health benefits these foods offer, but one that you might notice a little more is their ability to protect your eyesight. AMD is one of the most common causes of vision loss, particularly for people over the age of 60. Genetics and whether or not you smoke can play a role, but so can nutrition. AMD affects the macula, which is a spot near the center of the retina in your eye that’s needed for sharp, central vision and that lets you see things that are straight ahead. As you can likely imagine, AMD can severely lower your quality of life. Two specific carotenoids—lutein and zeaxanthin—are stored in the macula and are believed to protect it from oxygen and light damage. Lutein is easily accessible and is found in eggs and dark leafy greens like broccoli and spinach, while zeaxanthin is a little more difficult to find. However, it is in corn, orange peppers, and goji berries. Now you don’t need to eat a lot of these micronutrients to experience their benefits; just try and eat at least four servings of vegetables per day. 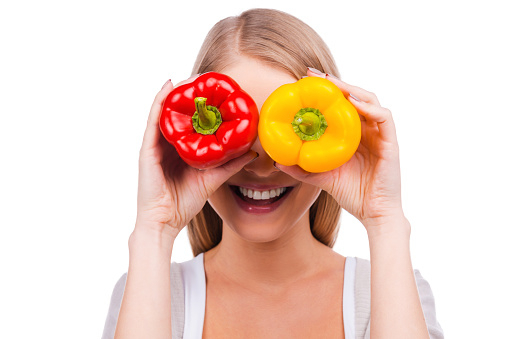 Protecting your eyesight is an extremely important and often overlooked component of nutrition and it allows you to enjoy the colors of the rainbow. Eat the colors you love looking at and experience all the rewards they can offer! “Facts About Age-Related Macular Degeneration,” National Institutes of Health web site; https://nei.nih.gov/health/maculardegen/armd_facts, last accessed October 21, 2015. Wu, J., et al., “Intakes of Lutein, Zeaxanthin, and Other Carotenoids and Age-Related Macular Degeneration During 2 Decades of Prospective Follow-up,” JAMA Ophthalmology, published online October 8, 2015, doi: 10.1001/jamaophthalmol.2015.3590, http://www.ncbi.nlm.nih.gov/pubmed/26447482.